On May 15th, Nike opened a first of its kind stand-alone conceptual retail destination. Located at 255 Elizabeth Street, 255 Studio is a culmination of sport and design brought together to offer an exclusive assortment of Nike Sportswear icons. Featuring a distinct apparel assortment and unique capabilities to personalize garments, each piece is crafted by a team of skilled Design Consultants. Offering specialized design tools and a variety of graphics, letters, and appliques, 255 Studio is a contemporary and classic platform for constructing ready-made and custom sportswear. Nike Sportswear enlisted elite members of New York City’s creative community, No Mas, to bring a true celebration of sport and culture to the new 255 Studio. To celebrate baseball season, No Mas brought inspiration from their travel experiences in countries known for their die-hard loyalty to baseball and its traditions: Cuba, The Dominican Republic, Puerto Rico, and Japan. 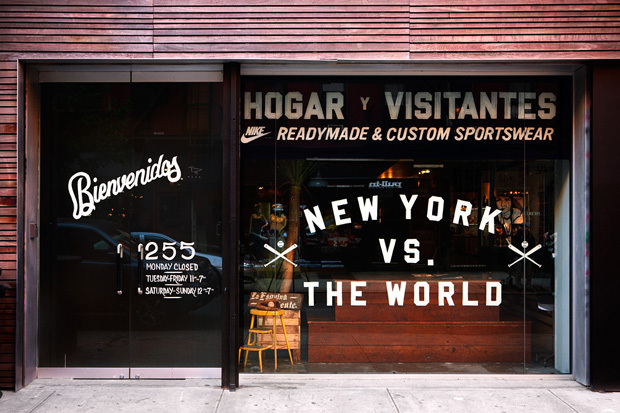 The result was “Hogar y Visitantes” (Home and Visitors) an installation and custom garment program that integrates cultural cues and iconic symbols unique to each nation, as well as, their relationship to the ultimate baseball mecca: New York City. Consumers can select from a robust assortment of unique apparel and embellishment created exclusively within 255 Studio, or can customize the experience with a 255 Studio Design Consultant. These one-on-one appointments allow the consumer to choose from a menu of applications applied to Nike Sportswear icons. A consumer can also draw inspiration from the available graphics to embark on a bespoke experience resulting in a garment that is truly one of a kind and available immediately. Immediately following the “Hogar y Visitantes” installation, No Mas will bring the excitement of the global celebration of football in time for the start of the games through a rich personalization design offering opening on June 1st. The store will be open both by appointment and walk-in, Tues-Fri 11am-7pm and Sat-Sun 12pm-7pm. Appointments can be made via appointments@nikeidcustomlab.com.